Having finished Book 3, I dived straight into Book 4 - and more quickly than I thought I would. I'm a planner. Some might say an over-planner. When I plan a book, I plan the hell out of it. I start out with an outline and character profiles and end up with chapter plans, with each scene planned and even bits of dialogue. I've found this is what works for me. Book 4 has been completely different for me. I usually know the story pretty well in my head before I start planning. I've thought about my characters and what they'll get up to (some people may call this daydreaming. And it is. And it's fun) so I have a good idea about the plot before I even start to plan. Not with Book 4. With Book 4 I had a main character and a few friends and family members and I had a title. But that's it. I had no plot. Nothing. So it was time to start brainstorming. Who was Delilah James (apart from my character, that is) and what was her story? I spent some time jotting down details about Delilah's life; how old she was, her hobbies, her family, friends and colleagues and slowly ideas for a plot began to form. 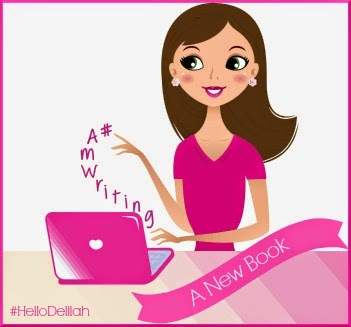 I wrote these ideas down, expanded on them and suddenly there it was; Delilah's story. With only three measly pages containing a flowchart of the main story (as opposed to the 40-50 pages of chapter outlines), I began typing Chapter One. I hadn't expected to start quite so soon. I thought I had lots more planning to do (chapter outlines, people) but it felt like the right time. So I went with it and now I'm 30,000 words into my new book. That's so exciting! I'm a rubbish planner- I don't tend to have a clue where the story's headed - just a main character and a situation... until this time. This time I have OCD planningitis... Maybe we've managed to swap brains accidentally :) Have fun!! !